We are getting ready to begin our next salvage project… one that is practically in our own back yard. Work will begin this week salvaging architectural elements from the historical Luther Hays house in Cullman, Alabama. 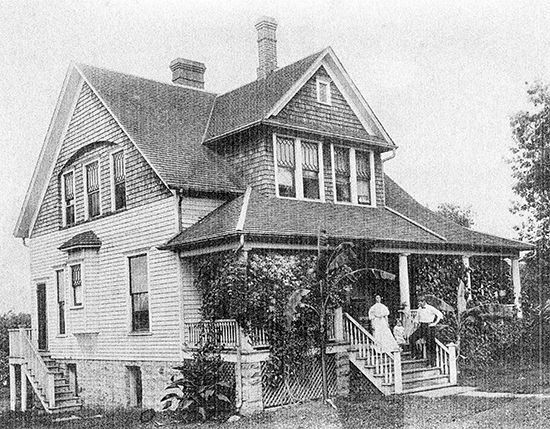 The house was built in 1901 by Dr. Luther Hays and his wife Ethel, affectionately called “Dolly”, by her loving husband. Dr. Hays moved to Cullman with his parents in 1878. Upon graduating from the University of Alabama Mobile Medical School, Luther entered the US Army Hospital Corps and served in the Spanish – American War. He then furthered his education at Grant Medical School, returning to Cullman in 1901 to establish his medical practice. Dr. Hays initially set up an office above the old People’s Drug Store, eventually moving it to an upstairs room in his home. When not seeing patients in his home office, Dr. Hays would travel by horseback and treat patients in their own homes. The Hays house was acquired a few years ago by the Cullman County Historical Society who began renovations in an effort to preserve it. The Historical Society dedicated the house as their new headquarters in November of 2010. 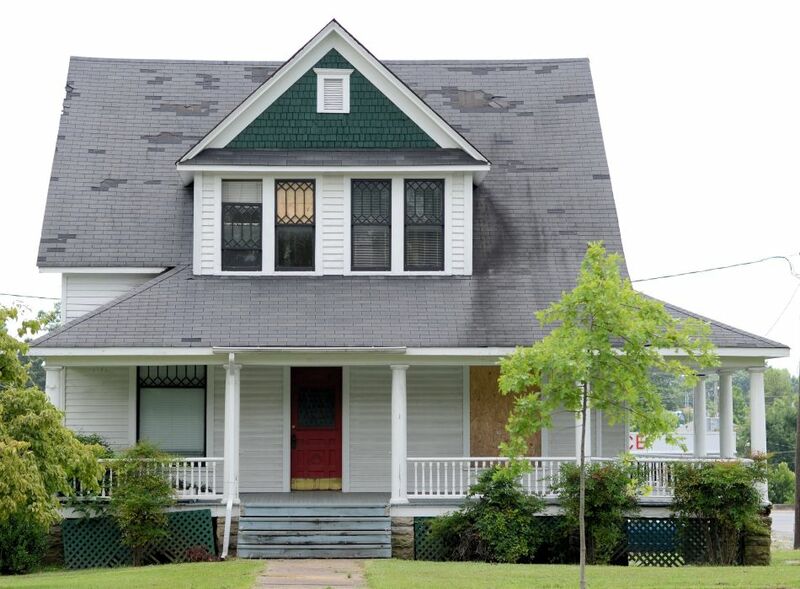 A short six months later, the house was severely damaged by the devastating tornados that ravaged downtown Cullman. The F4 tornado that ripped through our community in April of 2011 destroying many homes and businesses, took its toll on the Hays house. The amount of damage done was insurmountable and the cost of restoring the house not financially feasible for the Historical Society. The Society, in an effort to save the house, attempted to sell it, but there were no takers. The house was donated back to the County Commission earlier this year. Sitting on county property, the house must be removed and has been slated for demolition. Entering the front door, this beautiful staircase is the first thing to catch your eye. This is a lovely old house with many charming features. The house has beautiful wood flooring throughout. 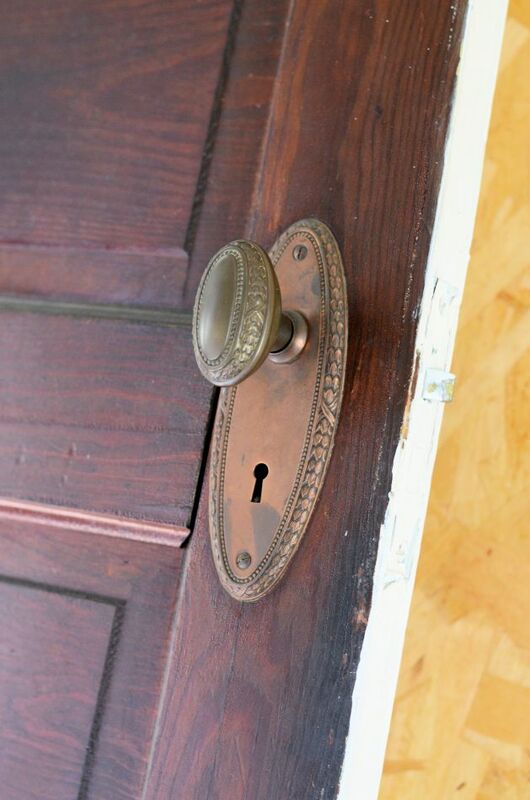 It is filled with solid wood doors equipped with brass and porcelain knobs. 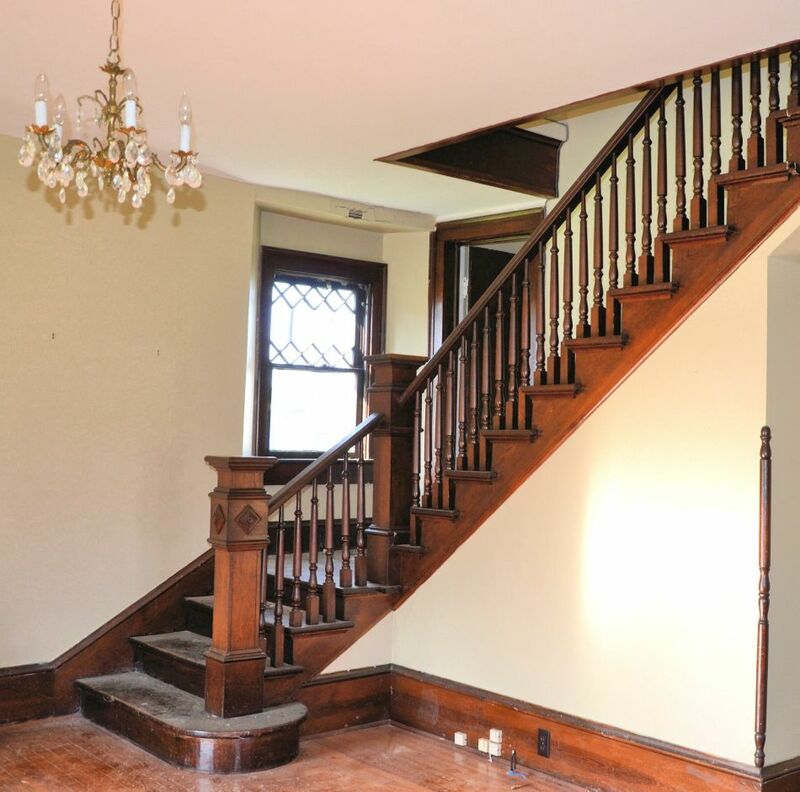 There are several large newel posts and dark wood spindles from the stairwell that connects the living and dining room. The house has many diamond-paned windows, interior wood trim, and a lovely wrap-around porch, a true Southern tradition. Southern Accents mission statement is to rescue, restore and protect architectural elements of historical significance. As with every salvage mission, we are often asked, “Why are you tearing down this lovely old house?” It is never our mission to tear down or demolish any historical structure. We only come on the scene after a structure has been scheduled for demolition by the property owner. We are the guys you WANT to see before the bulldozers move in. As we have done with past projects, we will enter the Hays house and remove any and all architectural elements that can be re-purposed and recycled. We view this as a rescue mission. Although the house can not be saved, many elements from the interior and exterior can be saved and given a new life. Preserving a piece of this local history for future generations is a mission that we take seriously. You can follow our current salvage mission on Facebook as well as on our Blog. We will be posting salvaged items on our New Arrivals page as they are made available. This old black and white photo shows the Dr. Luther Hays house in it’s prime! 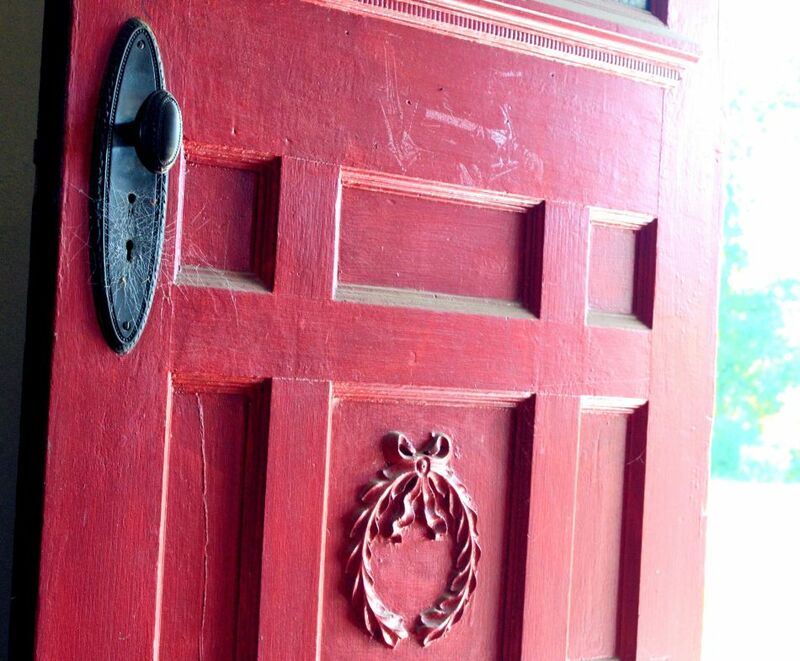 Who doesn’t love a red door? This one was a beauty. This chandelier hung in the front room. Two full and two half columns divided the front of this house in to two rooms. 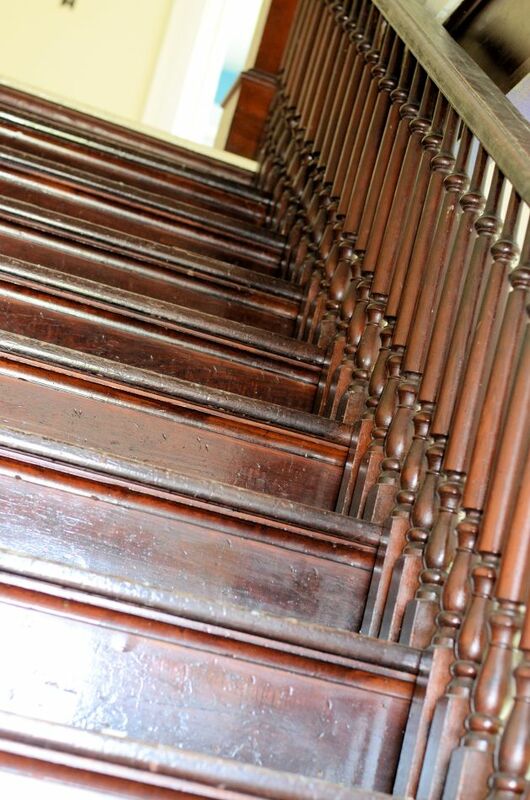 Every piece of this gorgeous staircase was salvaged. 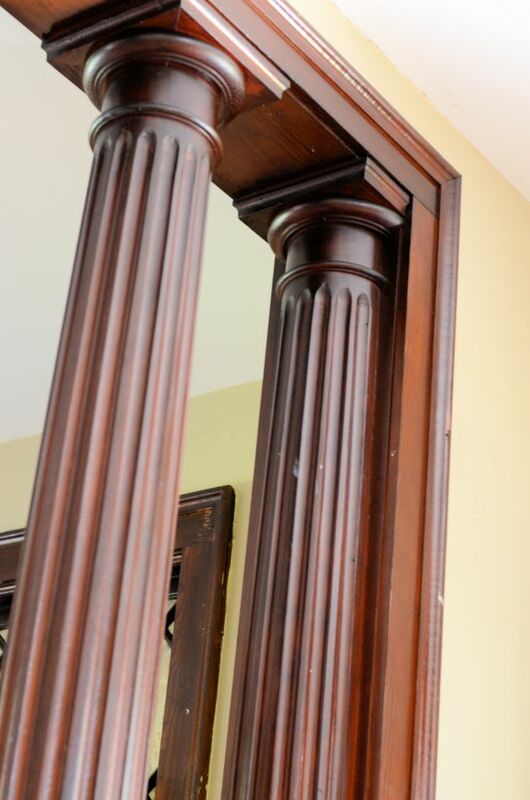 All of the beautiful solid wood newel posts were saved as well. 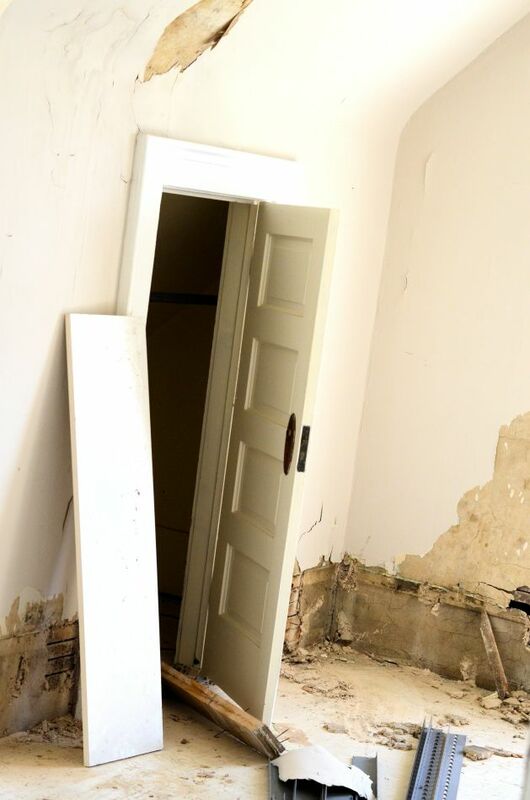 The doors and hardware were one of the first elements removed from the house. Unusually small doors led to small closets and storage rooms upstairs. All of the wide baseboards throughout the house were salvaged. All of the spindles and columns from the wrap around porch were salvaged. 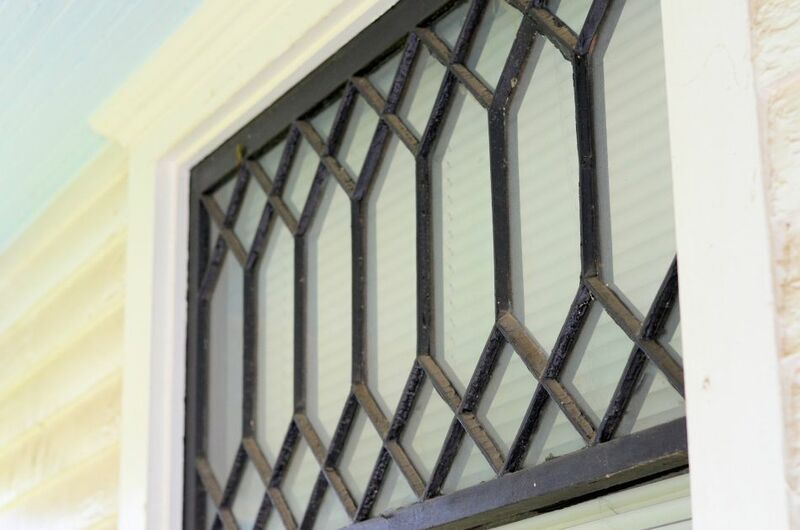 Several of the windows contained lovely diamond shaped panes. This picture was taken in the cellar. 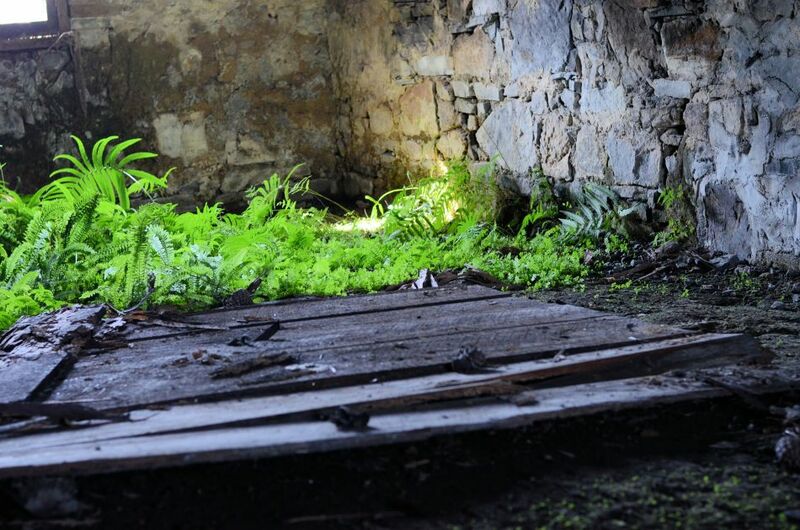 The ferns growing underneath the house, set against the rock foundation, were beautiful. After high school, Mauldin headed to Tuscaloosa to study at the University of Alabama, eventually transferring to Shelton State upon accepting an academic scholars bowl scholarship. 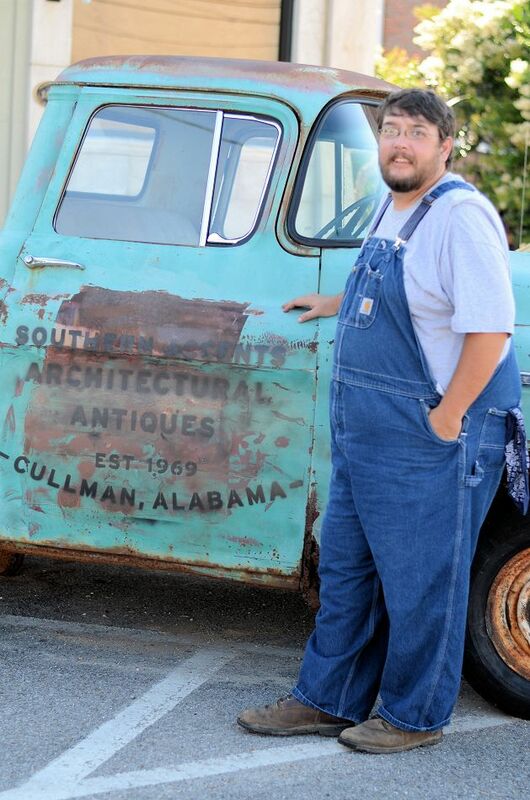 Although at the time he never had any immediate plans of returning to Cullman, he eventually found his way back to his hometown and would not want to be anywhere else. Upon leaving college, Mauldin enjoyed successful stints in the business world brokering freight for a trucking company and working in insurance sales. Not feeling satisfied with his work, Mauldin knew that he wanted something more. Not yet knowing what that something was, he approached Garlan, asking if he had any part time work in the interim. Garlan, at the time, had a huge salvage job lined up in Little Rock, Arkansas. He offered Mauldin an opportunity to travel with the team to Arkansas, telling him that if he worked hard he would pay him a fair wage. Mauldin had never held a job requiring physical labor, but willingly accepted the challenge and rose to the occasion. When asked what his goal/dream was for this year, Mauldin said that he wanted to become proficient in a sport. This past weekend Southern Accents sponsored Mauldin in his first PDGA (Professional Disk Golf Association) Frisbee golf tournament. The mountainous tournament terrain once again presented a physical challenge to this Trivial Pursuit beast. Mauldin conquered the daunting terrain and finished the tournament. Passionate about his new found sport, Mauldin has joined a local league with plans to perfect his skills… perhaps one day soon bringing home a trophy! We invite you to stop by our showroom and meet our team. Mauldin will be just one of the smiling faces here waiting to greet you. 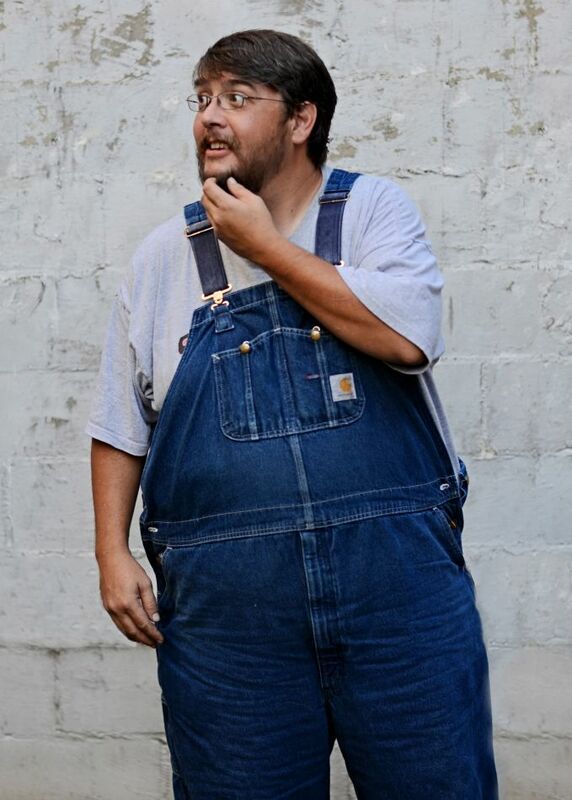 You can easily pick him out… he’s the one wearing the overalls! This past week took us to Tuscaloosa, Alabama on what most would think an unlikely salvage mission. A 1950’s apartment complex on the University of Alabama’s campus is about to be torn down. In its place, new apartments or condos will be built that will house future University of Alabama students. The apartment complex is not impressive from the interior or exterior view. The doors are not decorative, nor do they have ornate carvings. They aren’t really attractive… just your standard 1 and 2 panel doors. There was a lot of tarnished brass hardware but nothing outside of the ordinary. Many might wonder why we would waste our time on such a menial project? Architectural salvage is often thought of as the large, heavily carved doors, decorative wood mantels, ornate ironwork and gingerbread trim from elaborate Victorian homes and historical mansions. 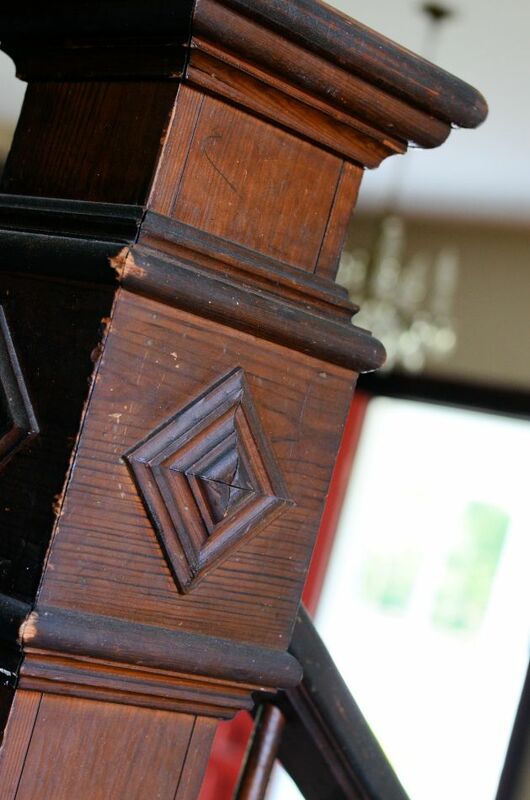 Architectural salvage is all of the above, but encompasses so much more. 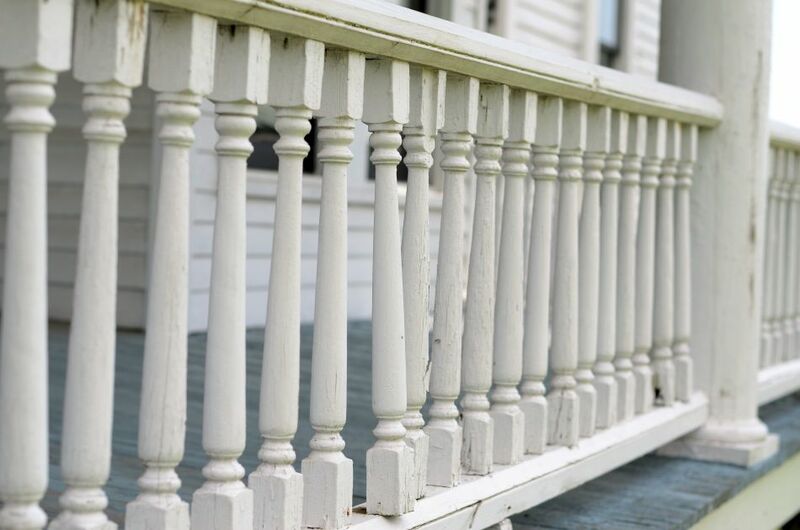 Any structure that has been built potentially contains goods that can be salvaged and reused: doors, cabinet hardware, baseboards, wood floors, bath fixtures, chandeliers, newel posts, staircase spindles, windows, trim, and ironwork. Usually, even the most humble structures contain architectural salvage that can be repurposed and given a new life. This apartment complex, for example, is full of painted wood trim that is in a Shabby Chic condition. Even though the wood trim is plain, the patina of the aged chippy paint covering the wooden boards is highly sought after. Everyday wear and tear of daily use, coupled with exposure to the sun, creates an unique texture that can only be obtained over time. These old boards will be salvaged and turned into something new such as picture frames, bulletin boards, chalk boards, table tops and other DIY projects. All it takes is a creative mind to imagine the numerous possibilities. One of the items that we returned with from Tuscaloosa were these interesting knobs that we removed from old gas wall heaters. The knobs grabbed our attention, because they are shaped like footballs. While these knobs have probably been forgotten by those who once used them, maybe catching a glimpse of them will ignite a memory of a special time in their life. A memory of a cold November morning getting ready for the Iron Bowl or an all night study session for that last final before Christmas break. The memories evoked by these old but simple treasures are as special as the items themselves. As Southern Accents rescues these items, the story of their past is protected and their new story begins. We are hanging on to a few of these “football” knobs ourselves, but are sure that the rest will be put to good use by someone with a creative idea. That’s all it takes, one idea and a little initiative to see an old simple item reinvented. Each idea, put into practice, serves to save one more door, or knob, or chippy paint piece of wood from our landfills. Our mission statement is to rescue, restore and protect architectural elements of historical significance. Simply put… “we save old stuff.” Fancy or simple, historical register or not, built in the 1800’s or 1950’s… quality materials that can be repurposed and given a new life do not need to end up in a landfill. We invite you to visit our showroom or website and consider salvaged goods for your next project. Our inventory changes daily. Whether you are looking for that ornate mantel or a simple door to use for your latest DIY project, we are sure that we have just what you are looking for! 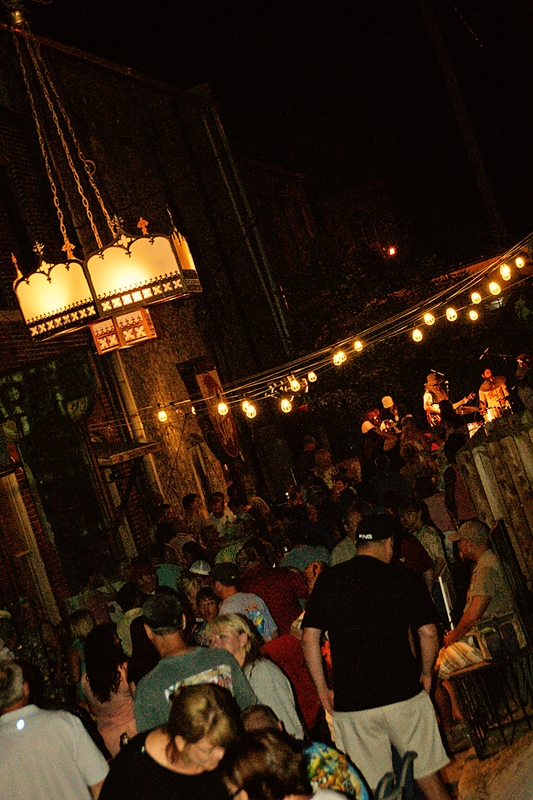 Our 2013 Alley Party held Saturday night, July 20th was a huge success! This event, in it’s third year, was first held after the devastating tornadoes in April of 2011 ravaged Cullman, Alabama. The first Alley Party was planned during a time when folks were physically and emotionally weary. The community had come together to help with the clean up efforts after many homes and businesses had been heavily damaged or totally destroyed by the F4 tornadoes. Southern Accents owner, Garlan Gudger, Jr., saw the need to bring everyone together for a few hours to rest and rekindle spirits. This year’s party was the biggest and best yet! We would be remiss to not offer our thanks to those who made this year’s event possible. The Southern Accents team put in several weeks worth of hard work preparing for the party. From cleaning and decorating the alley to constructing the stage and promoting the event, the Alley Party could not have happened without all of our team members help. We would like to say a HUGE thank you to Cullman Sign and Banner. They provided the awesome welcome and social media banners as well as all the fun koozies we gave away to our guests. Bill and Liz St. John worked hard baking incredible gourmet pizzas in their portable wood burning pizza oven for all the early arrivers. Folks are still talking about the pizzas and we are all coveting that oven on wheels! Clifton Holt of Little Savannah Restaurant was responsible for the mouth watering ribs. Declarations were heard from throughout the crowd that they were the BEST ribs they had ever had. Please visit Clifton at his restaurant in Birmingham, Alabama. Thanks to Shindigs food truck, also from Birmingham, for driving up and feeding all the hungry party goers late into the night. The food was delicious! Amber and Carl from Southeastern Attractions did an outstanding job booking the entertainment for the night. Thanks to Cliff Fountain for all his hard work with the staging. Cliff hung with us and was a tremendous help all night! You can visit Cliff at Cullman Quick Copy. Banditos… you guys ROCK! We had a blast! The band entertained the crowd until well into the night with their mix of classics and original tunes. Not only are these guys super talented but also incredibly nice. We can’t wait to have you back! Thanks to Julia Masters for the incredible job creating the artwork for our limited edition t-shirts. We would also like to thank Jason White from The Final Touch for stepping in and doing a tremendous job printing the tees and having them ready in time for the party. If you missed the opportunity to pick up a t-shirt, we have just a few left. You can order them directly from our website. Lisa Jones and Sharon McCormick Tucker did an outstanding job photographing this year’s event. 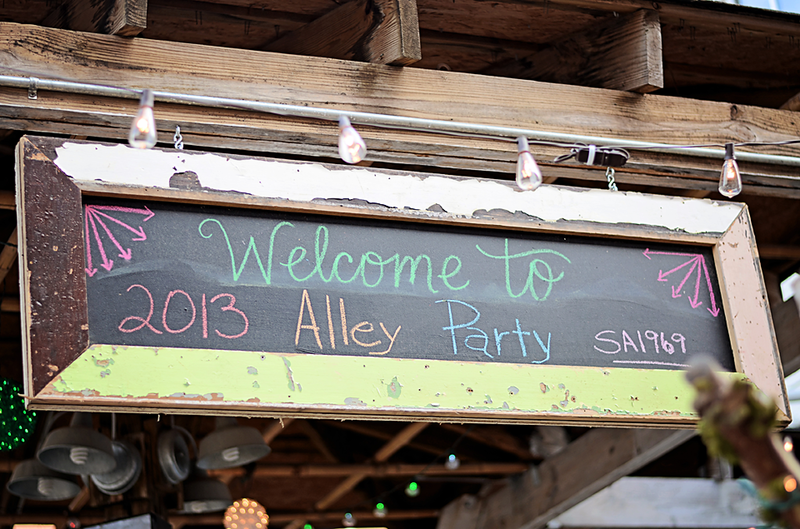 If you have not visited our Facebook page, please stop by and flip through the 2013 Alley Party photo albums. 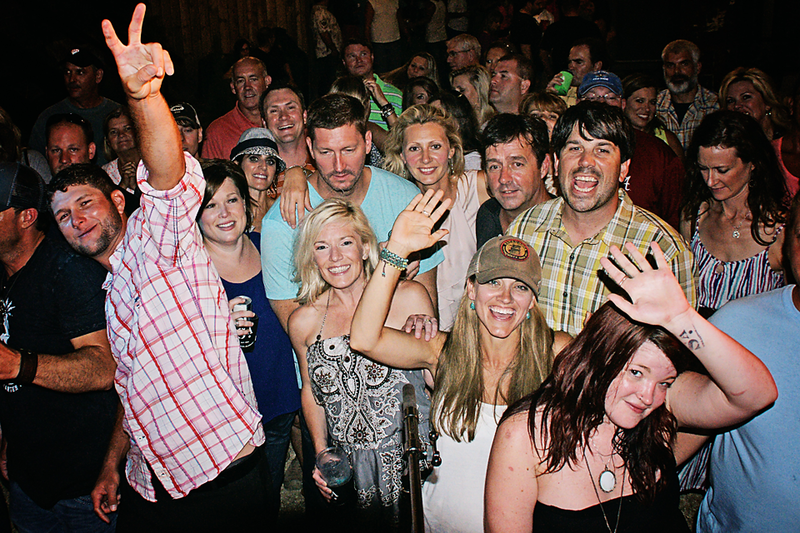 If you attended the Alley Party, please look for your picture and tag yourself and your friends. Thanks to our sponsors JCR Recycling and Bark-ley Contracting. We would also like to say a special thank you to the Cullman Police and Cullman Fire Department. You guys are the best! 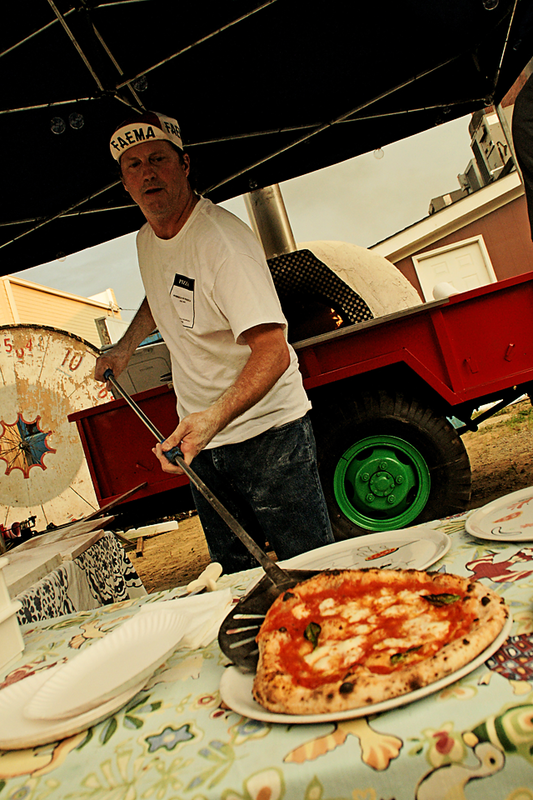 Bill St. John feeds early arrivers slices of gourmet pizza baked on location in his wood burning oven! 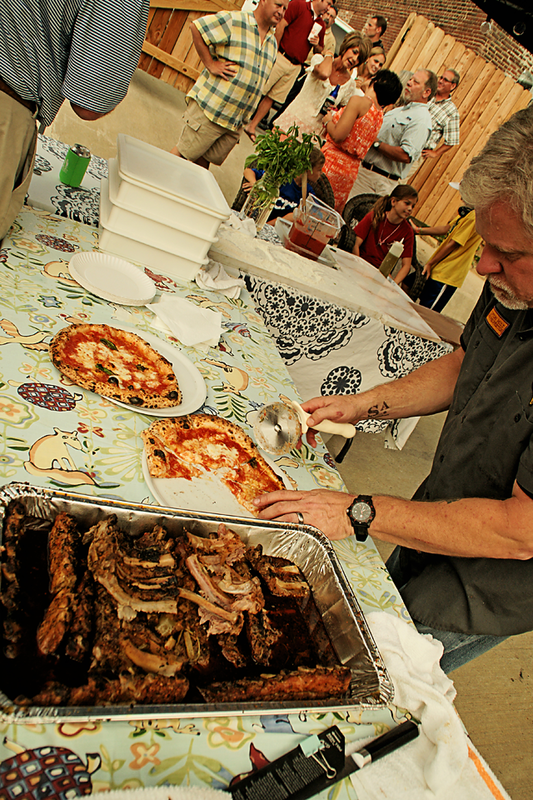 Clifton Holt of Little Savannah Restaurant serves up pizza and ribs. Guests arrived early to enjoy great food, music, and fun fellowship. 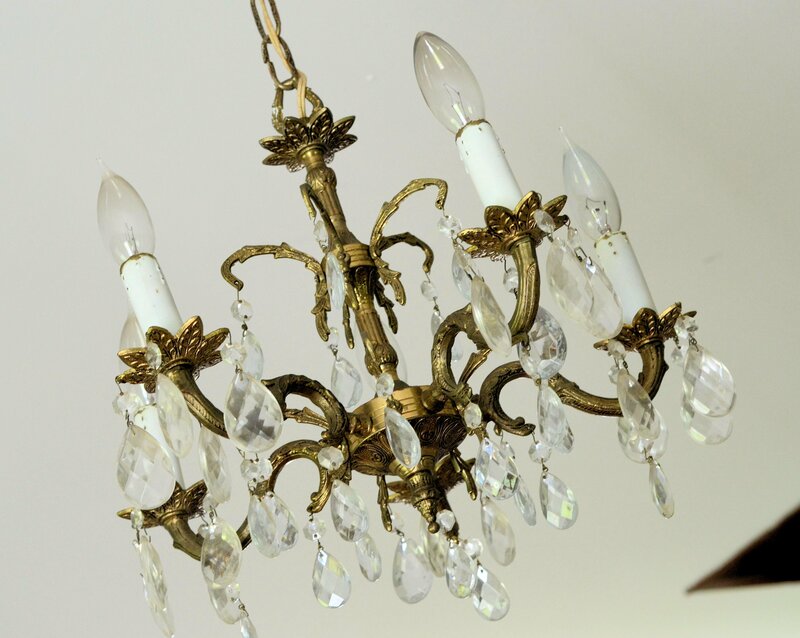 The Gothic chandelier that hung from a crane was a huge hit with party goers…especially as it lit up the night sky. 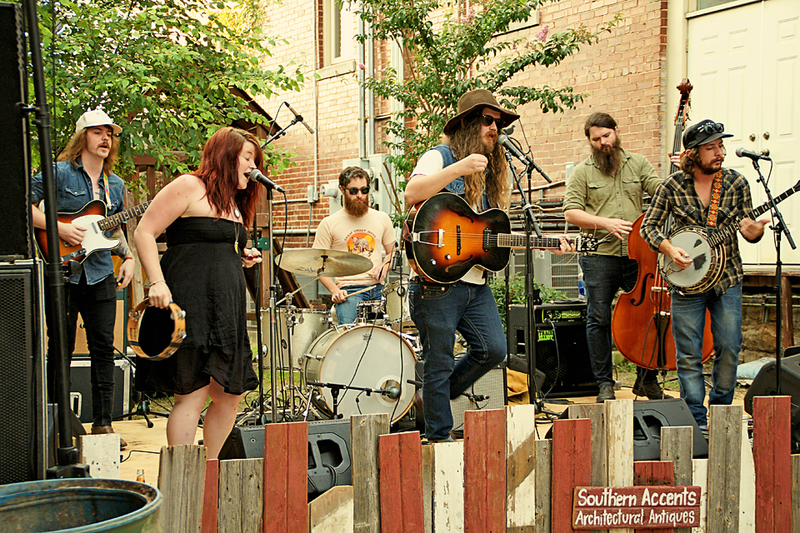 The Banditos entertained the crowd with their eclectic mix of Americana and Folk music. All good things must come to an end! 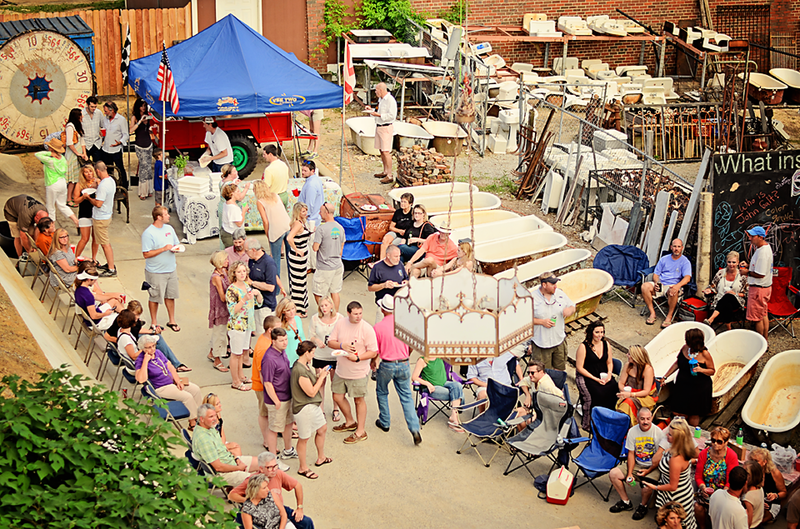 Thanks to everyone who attended the 2013 Alley Party! We can’t wait for the next one!